28 September 2016 (De La Rue) – De La Rue congratulates The Central Bank of The Bahamas on the occasion of the launch of the new $10 banknote, the world’s first circulating note with its Active™ security thread. The new $10, launched today, has been designed and printed by De La Rue in close collaboration with the Central Bank. Using concept designs provided by the Bank, this note is a world first for a fully circulating banknote with De La Rue’s Active™ security thread and the first of a new family of banknotes that will be introduced over the next few years. 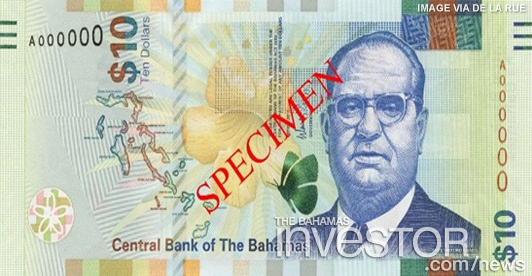 The vibrant new note portrays Sir Stafford Sands, a former finance minister who helped create the tourism industry in the Bahamas, and on the vertical back of the note the lighthouse at Hope Town, Abaco. The new security thread also appears on the back of the note. When the note is tilted, the colours of the sand dollar and the number 10 in the thread switch from light on dark to dark on light. There is also a colour changing SPARK® Orbital™ ink in the butterfly on the front of the note. Commenting on the launch, Governor John Rolle, said “We are delighted to be pioneering the latest security thread technology and thank De La Rue for helping us with this first note in our new series”. De La Rue’s Global Account Director Ruth Euling stated “We are honoured to be working with the Bahamas. Our relationship dates back to 1938 and we are delighted to see one of our newest security features in this stunning banknote”. Popular NBA team Miami Heat touched down in The Bahamas Monday for its annual training session. Watch a report on the visit here.